Video: Lee discusses his research on job search envy. Job seekers who stay in the search longer or see peers getting hired may falsify their résumés, according to a School of Management study. Published in the Academy of Management Journal, the study analyzed how the length of a job search and a person’s career situation may lead to unethical behavior. The second study tracked a cohort of 77 graduate students enrolled in a Master of Human Resources program at a large U.S. university. 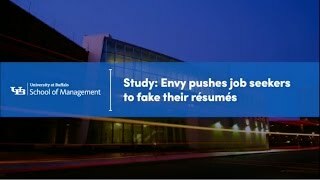 The researchers surveyed participants over the course of two years, tracking job search envy during both internship and job searches. An act passed by Congress in 2012 isn’t stimulating the investment and job creation promised by its proponents, according to new research from Michael Dambra, assistant professor of accounting and law. A study forthcoming in The Accounting Review is the first to examine the consequences of the Moving Ahead for Progress in the 21st Century Act (MAP-21), which reduced the minimum amounts that firms must contribute to their pension plans. Dambra found that rather than reinvest the funds, the average firm either holds the funds on its balance sheet as liquid assets or pays them out to shareholders. Video: Dambra discusses his research. 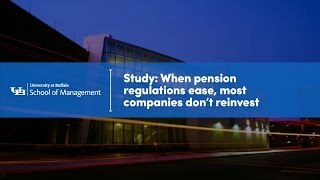 Dambra analyzed mandatory pension contribution data provided by the U.S. Department of Labor immediately before and after the passage of MAP-21 to examine how firms’ capital budgeting and financing policies were affected. He found no average association between pension funding relief and capital expenditures, research and development, cash acquisitions, working capital or employment in the two years following MAP-21. “Of the estimated $145 billion in pension funding relief provided by MAP-21, managers spent nearly $40 billion on stock repurchases and retained more than $52 billion on their balance sheets,” says Dambra. Video: Bezrukova discusses her research on diversity training. While workplace diversity training programs can build awareness of cultural differences, they usually are less effective at changing attitudes and behaviors, according to research co-authored by Kate Bezrukova, associate professor of organization and human resources. 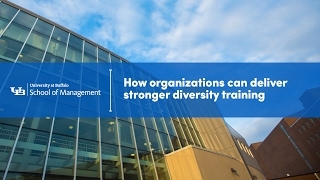 Published in Psychological Bulletin, the study found the success of diversity training varies based on content, length and the presence or absence of related initiatives. Bezrukova and her team examined more than 40 years of research across a variety of fields. They found training had immediate positive effects on participants’ knowledge, attitudes and behaviors toward diverse groups. Over time, however, their attitude and behavioral changes decayed or reverted, while their cultural knowledge remained consistent or increased. “The attitudes this training attempts to change are generally strong, emotion-driven and tied to our personal identities,” she says. The study showed training works best when it is mandatory, delivered over an extended time period, integrated with other initiatives and designed to increase both awareness and skills. In addition, participants preferred programs with multiple instruction methods. Bezrukova’s co-authors are Karen Jehn, professor, University of Melbourne Business School; Jamie Perry, assistant professor, Cornell University School of Hotel Administration; and Chester Spell, professor, Rutgers University School of Business-Camden. When materialistic consumers believe in the American dream — that it’s possible to improve their economic status through hard work — they are less likely to spend impulsively, according to new research from the School of Management. “When materialistic people believe they have the power to change their financial circumstances, they’re more likely to save money and focus on long-term success, rather than the short-term pleasure of buying the latest technology or products,” says Sunyee Yoon, assistant professor of marketing. However, the research also found optimistic consumers were likely to make unplanned purchases they thought could help achieve their goals (for example, new clothing for a job interview). Yoon and her co-author, Hyeongmin Christian Kim, associate professor in the Johns Hopkins University Carey Business School, conducted four studies with urban consumers and university students. In each study, they randomly assigned participants to two groups, manipulated their perceptions of economic mobility with news reports and measured their likelihood to spend impulsively. Yoon says nonprofits working to reduce consumer spending and debt should highlight examples of the American dream in their marketing. In addition, she advises marketers to research perceptions of economic mobility in other countries before planning international campaigns. In addition to being outstanding educators, School of Management faculty are leading scholars in their fields. Their research is cited often by mainstream media worldwide, including The Washington Post, Bloomberg Businessweek and Forbes. However, keeping up with all the exciting research that’s coming out of the school can be a challenge. To that end, we rolled out a series of videos last semester featuring research from emerging thought leaders in the school. Dubbed “Two-Minute Tuesdays,” the series featured a new video each week where a faculty member described a research initiative — in less than two minutes. Topics ranged from shared leadership to supply chain costs in health care to cloud computing and more. You can see all eight videos on the School of Management’s website at mgt.buffalo.edu/twominutetuesdays. Sink your teeth into them and enjoy. Check out the School of Management’s new blog: On Leadership. With a rotating cast of faculty and staff authors, there’s a new topic every couple of weeks.